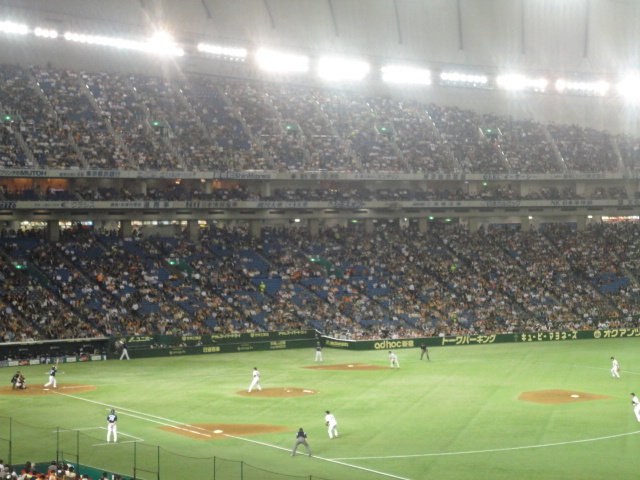 And so my first baseball game ever was in Japan. It was very exciting just to be in the stands cheering for a team I never heard of until that day. Either way I liked that the Tokyo Giants shared the same mascot as my high school. It made it that much more easier to cheer for them. The crowd was more “animated” than any crowd I’ve seen at any sporting event back home. Even more interesting were the cheerleaders. I’ve never heard of cheerleaders in baseball, yet sure enough they were there and were just as upbeat as the crowd. Too bad the opponents, the Buffaloes, didn’t have too many fans cheering for them. It was a close game with the Giants winning by a couple of home runs. I even bought a hot dog and some pop from there. The ketchup and mustard came in this little innovative container that you squeezed the ends together and both sides busted open and squirted onto the hot dog. It’s funny how something so small and simple is so impressive. Ok I’m making it out to be more than it really was.